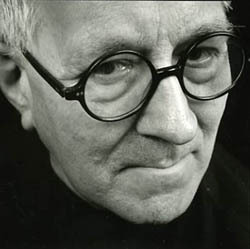 Peter Cook, UCL Bartlett Professor of Architecture and Chair of the UCL Bartlett School from 1991-2005, received a knighthood for services to architecture in the Queen's Birthday Honours this week. The accolade recognises a multi-faceted, unorthodox fifty-year career that started with aspirations to be an architect from the age of eight. The ambition never wavered. Professor Cook left his native Southend to study architecture at Bournemouth College of Art from 1953-58, then at the Architectural Association School of Architecture in London where he graduated in 1960. It was during his first job at James Cubitt & Partners that Professor Cook co-founded Archigram with five other architectural young bloods. Initially a magazine discussing revolutionary ways of thinking about architecture, the group soon developed experimental projects that were exhibited worldwide and proved seminal. Within the group he was 'the talkative one' who enjoyed conveying concepts through cartoons rather than academic-style essays. Professor Cook revelled in drawing analogies between people's quirks and the unexpected possibilities of their environment. Archigram's many iconic projects explored pop culture and emerging technologies and were predicated on the rationale of fun and pleasure as ends in themselves. Among the best known are Walking City, a self-contained pod of urban elements; Suitaloon, a garment that converts into a dwelling; and Blow-out Village, an entire temporary city inflated by a hovercraft. In 1970 Professor Cook became director of the Institute of Contemporary Arts, the venue for Archigram's début exhibition 'Living City' seven years earlier. He held the position for two years, then moved on to direct the independent gallery Art Net until 1980. From his earliest career Professor Cook has been an enthusiastic, self-confessed 'maverick' communicator of innovative approaches to architecture, placing an equal emphasis on the teaching and practice of architecture. At the age of 27 he returned to the Architectural Association to teach and went on to become an internationally renowned academic. He was made Life Professor of the Frankfurt Staedelschule (Art Academy) in 1984 in recognition of the way in which he raised its architectural profile, an achievement that he repeated on joining the UCL Bartlett School of Architecture in 1990. At the time of his arrival, architecture education at the UCL Bartlett, he says, was "fragile". "People didn't generally understand that architecture is an art and a science." He went about his remit to revitalise the school by recruiting over 20 new academic staff, changing its structure and reworking the examination process - all in the first nine months of his tenure. The UCL Bartlett rapidly secured a reputation as a school of excellence and innovation on the international scene. During his regime it more than doubled in size, and has notched up more prizes and awards than any other British school. "I think on my feet," explains Professor Cook. "The trick is to go in knowing your business and ask the punters - the students - what they think. I spent weeks gathering opinions and I had a lot of support from the planners. Then I just kept moving - the hardest thing is to keep your momentum, but I'm glad to say that the standard of work is still tremendously high and widely regarded." After retiring from the Bartlett Chair in 2005, Professor Cook's inimitable energy saw him continue to teach around the world, particularly in Sweden, France and the US. "I've never been so busy," he says. He holds two guest professorships and in the autumn is publishing a book on architectural drawing, the latest in a long line of influential volumes. Retirement from the UCL Bartlett has created more time for building. He works with two consultancies, through whom he has three projects in the pipeline: social housing, a department store and "an inflatable structure" in Madrid. However, the most high profile job on his books is designing the 2012 Olympic stadium in London. Professor Cook has won several international competitions for social housing, an entertainment centre, solar-energised housing, an information museum, a museum of antiquities and the Kunsthaus - a modern art museum in Graz, Austria. The latter project won him a shortlisting with Colin Fournier for the Stirling Prize in 2004, two years after Archigram received the Royal Gold Medal for architecture from the Royal Institute of British Architecture. Professor Cook believes he received his knighthood for his many-stranded career as an experimentalist, educator and designer. "It's important that you can be recognised for doing valuable work without having to build lots of big buildings, rather for being a maverick creative academic. I'm still not rich though, but hopefully I'll get better seats on planes from now on." A visionary who describes his style as "lyrical, technical, mechanical, even slightly gothic", Professor Cook is driven on by a belief that "there's room for improvement and the application of ideas in almost every situation." The future of architecture can only move forward if the young are enthused, he says, and unsurprisingly he cites the achievements of former students as his greatest source of satisfaction. One opportunity to see the fruit of his teaching arises tonight, when Professor Sir Peter Cook will be at the opening of the 2007 UCL Bartlett Summer Show.